Vans Triple Crown of Surfing is in full gear and ready to start the Vans World Cup tomorrow at Sunset. 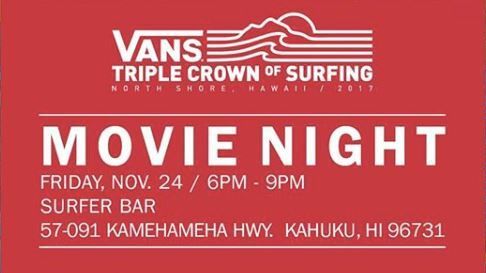 So, Vans wants to be sure everyone’s stoked to the max, by presenting a double-feature movie screening tonight, Aloha Friday, November 24th at @surfer, the bar from 6:00 p.m. to 9:00 p.m.
Drop in this eve early for good seating to watch two new films: “Blue Intensity”, a film by George Trimm plus “Dreaming Together”, by Bruno Tessari. It’s a full night of great films & company. See you there!